Edvard Munch (1863–1944), Golgotha (1900), oil on canvas, 80 x 120 cm, Munchmuseet, Oslo. Wikimedia Commons. Munch had concluded the second section of his Frieze of Life, Flowering and Passing of Love, with Melancholy (1894-96), showing the melancholy resulting from failed love. In its third section he moves on to consider Life Anxiety. The first of the five paintings in this section presents a composite summary, originally known as Insane Mood then Red Clouds at the time that this version of the Frieze was exhibited. 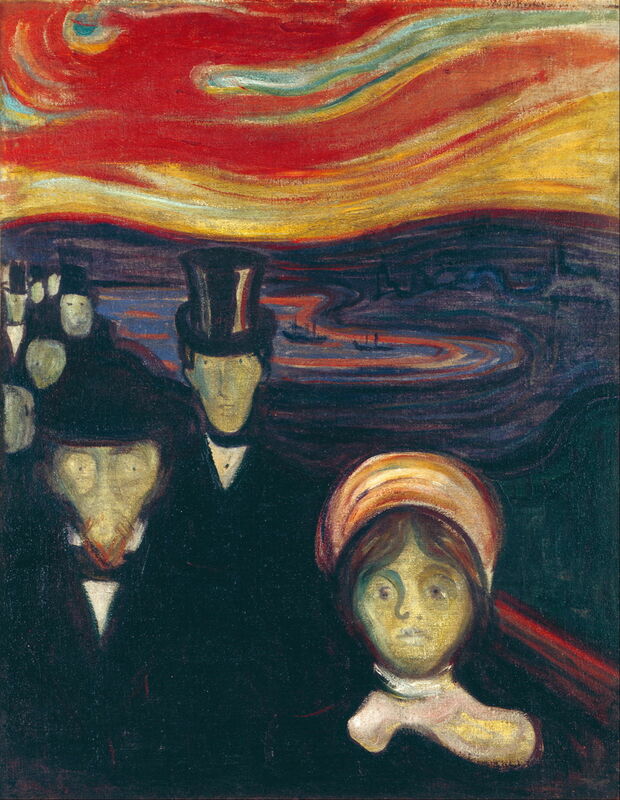 It uses the same setting and colour as The Scream, which ends this section, but is populated with the crowd from Evening on Karl Johan below. In this context it does more than that, in providing the individual elements which are teased out and developed by the other paintings in this section. First, Evening on Karl Johan shows the crowd from Anxiety in an autobiographical scene. During Munch’s affair with ‘Mrs Heiberg’, he had arranged to meet her on Karl Johans Gate, the long, straight main street in the centre of Oslo. As he waited for her, his anxiety grew, exacerbated by crowds of people walking towards him. 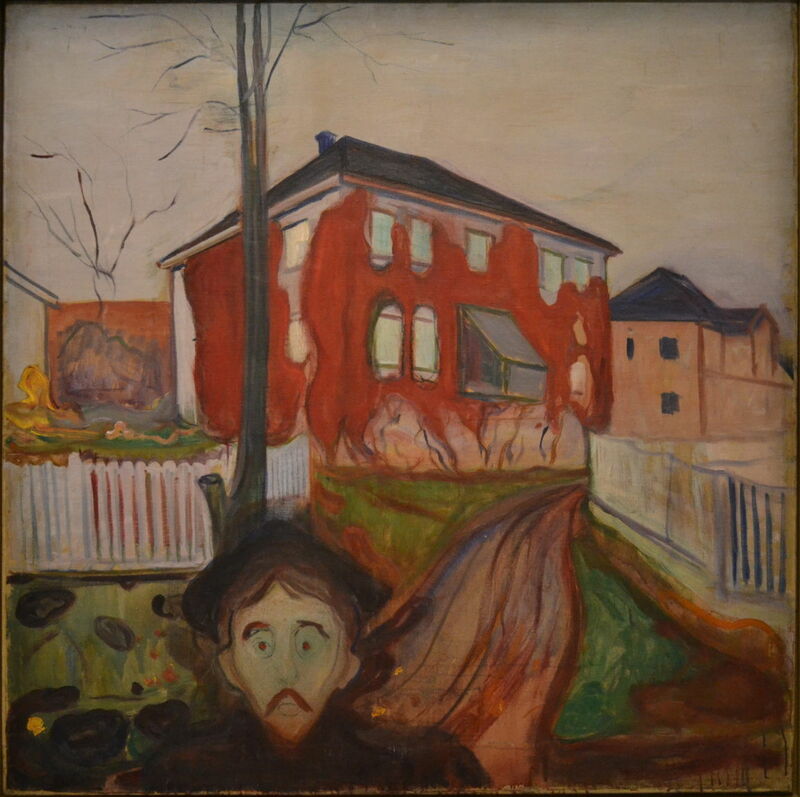 Munch’s later depiction of this greatly foreshortens the perspective of this section of the street from the Royal Palace towards the Storting (parliament building), a distance of around 300 metres. This packs the pedestrians together and, coupled with their nightmarish faces, enhances its troubling feeling of anxiety. Edvard Munch (1863–1944), Red Virginia Creeper (1898-1900), oil on canvas, 119.5 × 121 cm, Munchmuseet, Oslo. Wikimedia Commons. Red Virginia Creeper develops the red theme from Anxiety. 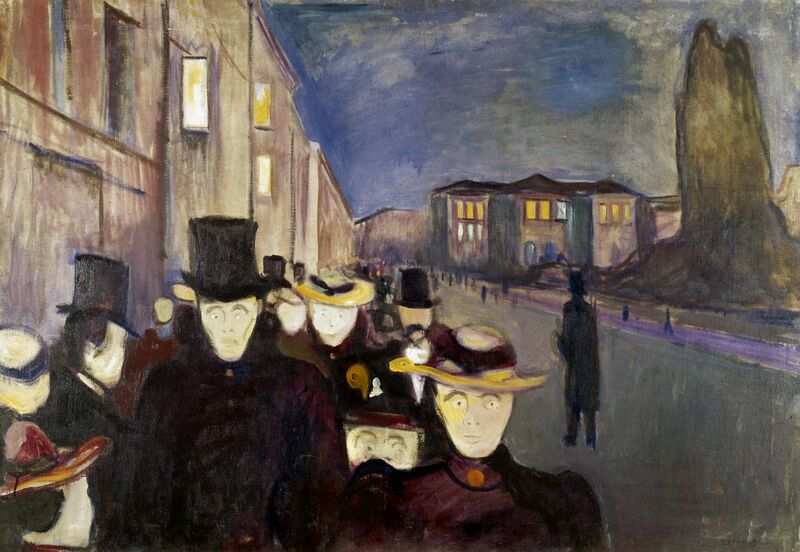 One of the paintings which Munch made after his first version of the Frieze to augment it for this second version, it contrasts with Evening on Karl Johan by its relatively open and undistorted view. The building shown is Kiøsterud in Åsgårdstrand, which Munch also included in his slightly later Girls on the Bridge (c 1902). This painting develops the theme of anxiety, with the creeper staining the walls of the building blood red, and enclosing it in its deadly embrace. In the foreground, almost oblivious of the building behind, is the anxious face of a man with a drooping moustache and pointed beard, staring at the viewer. The model for that face was most probably the author Stanislaw Przybyszewski, who also featured in Jealousy. 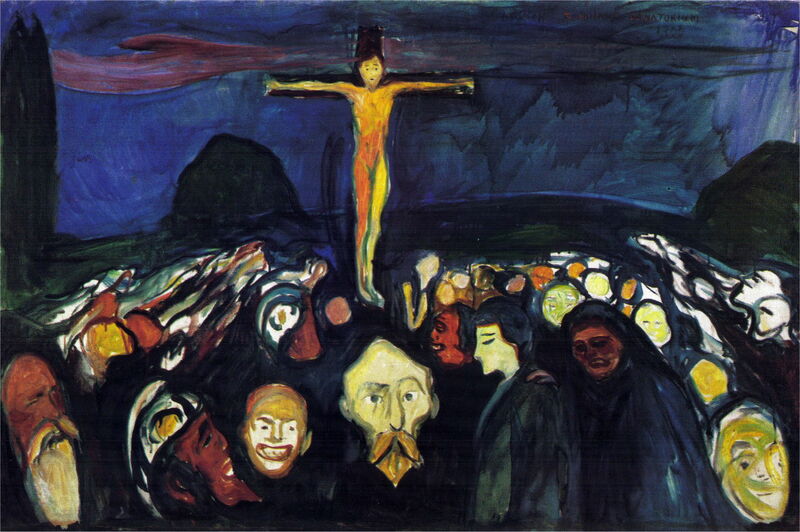 Golgotha is another late addition to the second version of the Frieze, painted when Munch was convalescing in the Kornhaug Sanatorium during the winter of 1899-1900. It uses Christian iconography, of the crucified Christ and the crowd of spectators, to develop the themes of crowds and persecution. It is usually suggested that Munch saw himself as the object of that persecution, something borne out by its hostile critical reception. There are several recognisable faces in the front row of the crowd. From the left, these are Christian Krohg (Munch’s teacher), [a bailiff], Gunnar Heiberg, Stanislaw Przybyszewski, the young Munch (in profile), and Karen Bjølstad (Munch’s aunt, who raised the family). I was walking along a path with two friends. The sun was setting. I felt a breath of melancholy. Suddenly the sky turned blood-red. I stopped and leant against the railing, deathly tired, looking out across flaming clouds that hung like – blood and a sword over the deep blue fjord and town. My friends walked on – I stood there trembling with anxiety, and I felt a great, infinite scream pass through nature. 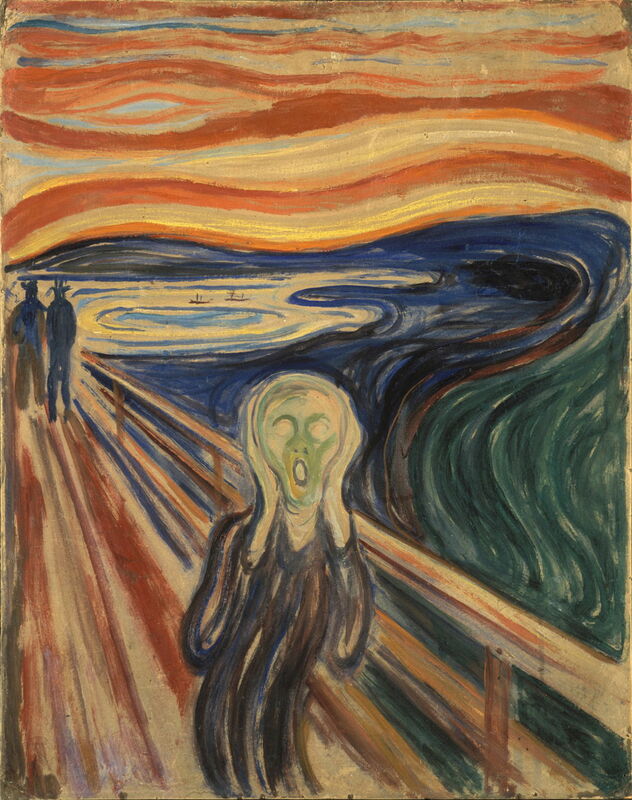 Edvard Munch (1863–1944), The Scream (1910), tempera on cardboard mounted on panel, 83 × 66 cm, Munchmuseet, Oslo. Wikimedia Commons. 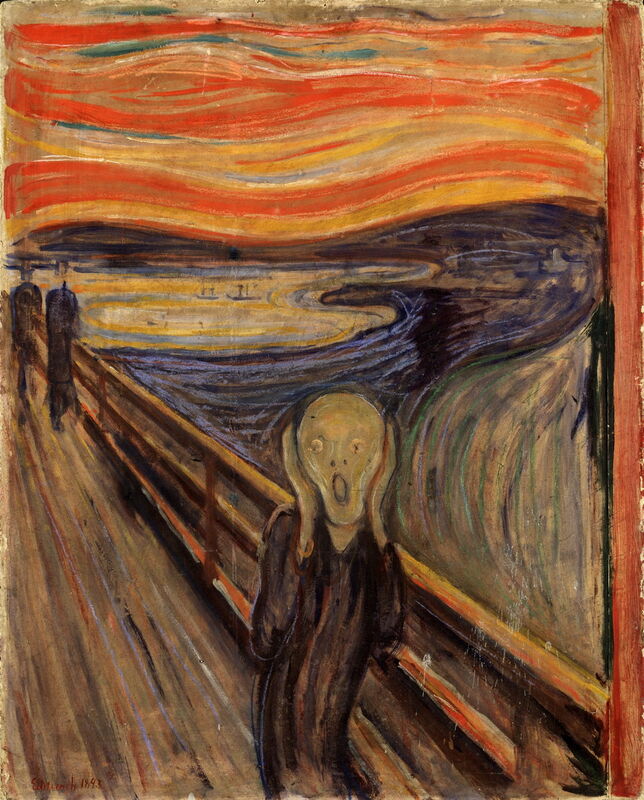 The other famous version of The Scream from 1910 differs only slightly from that above: the two figures at the left edge are now definitely walking away, into the picture plane, and the screaming face in the foreground no longer has any eyes as such, but only blank spaces for the sockets. This later work was stolen from the Munch Museum in Oslo in 2004, and finally recovered in 2006. With this infinite scream passing through nature, the Frieze passes to its fourth and final section, Death. Thank you: what a fascinating suggestion. Yes, nacreous clouds like those can be pretty disturbing, and I love your photo, thanks. The mysteries of sleep: what’s making my hard drive sleep?